Our October 13 meeting will feature Ken Fuentes as our demonstrator. 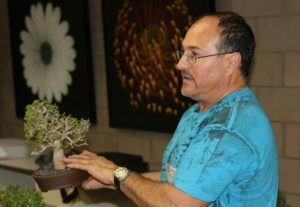 Ken will be demonstrating the many techniques that can be used to grow and style ficus salacaria, better known as narrow-leaf ficus. He will be sharing a technique called “bending”, an alternative to wiring. 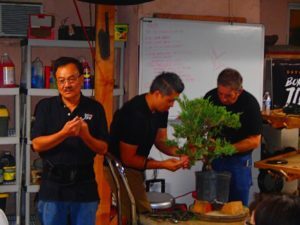 Ken is a founding member of the Conejo Valley Bonsai Society. 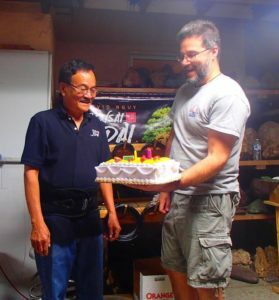 He has been active in bonsai for 42 years. Originally from Miami, Florida, he was a member of the Bonsai Club of Miami. 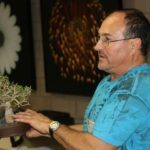 He has worked with many bonsai experts including John Naka, Ben Oki, and Warren Hill. 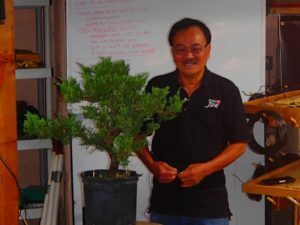 Ken’s recommendations for ficus bonsai can be used with most ficus variations. 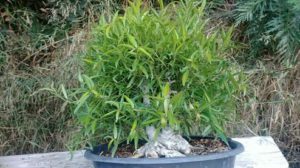 Feel free to bring in any problem ficus trees you have for an evaluation in addition to his demonstration. Thanks once again to Peter and Marissa Macasieb, we will have our November meeting at their home to make up for the Arboretum program conflict in Nov. It will be a regular meeting beginning at 6pm with scheduled refreshments and no potluck. The new Fall season is the time to collect seeds to start new trees. Look for seeds and seed balls around trees in parks and forests. I look for oak trees with a style and shape I like and collect the acorns under it. Seeds will bear the characteristics of the tree they are from. Once seedlings have developed, you can gently wire them into a shape of your choice. This will create movement early for a great future shohin or, if you are young enough, a larger tree. There is nothing quite like watching a new seedling pop through the soil, yearning to be a new tree. We had a great turnout at the home of David and June Nguy in Sept. It was enjoyable walking through their beautiful bonsai garden and hearing David’s commentary about his trees, all before the meeting started. David worked on a San Jose juniper for his demonstration. He started by talking about our recent heat waves and the foliage damage that resulted. He recommended letting damaged trees recover from the heat before doing any fertilizing. Feeding could further stress a tree already weak from damage. 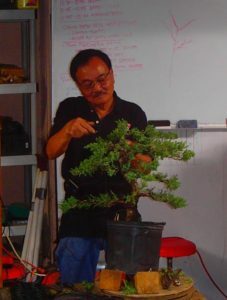 He talked about using nursery stock for bonsai and said it is difficult to find stock with a good root base, because the roots are not trained for bonsai. David said you often need to start with good trunk movement and begin root training for a future tree. David involved the audience in determining the front of the demo tree, and then started cleaning off inside foliage to make room for wire. He also cut out foliage growing downward. He emphasized not pinching off growth tips because they store energy. David recommended letting branch tips grow and later cutting back inside to control branch length. David was assisted by Jason Chan and Lou Camerota who wired branches while David continued his commentary on the tree. His true artistry came through when the wiring was completed. David bent and positioned branches to match his vision for the tree, and he cut out unnecessary branches. The final product was a beautiful looking tree David said was just the beginning of the tree’s development as a bonsai. Thanks again to both David and June for their hospitality and providing a wonderful evening of bonsai. Liz Do was the raffle winner of the demo tree. June graciously donated a pot to go with the tree for later planting.